I have a bad habit of putting off my homework until the morning its due. I’ll start big projects early, but I won’t finish them until the last available morning. Today was one such morning. I didn’t have class until 10, but I got to school at 8, checked out the textbook I needed, and went to the rotunda to study. 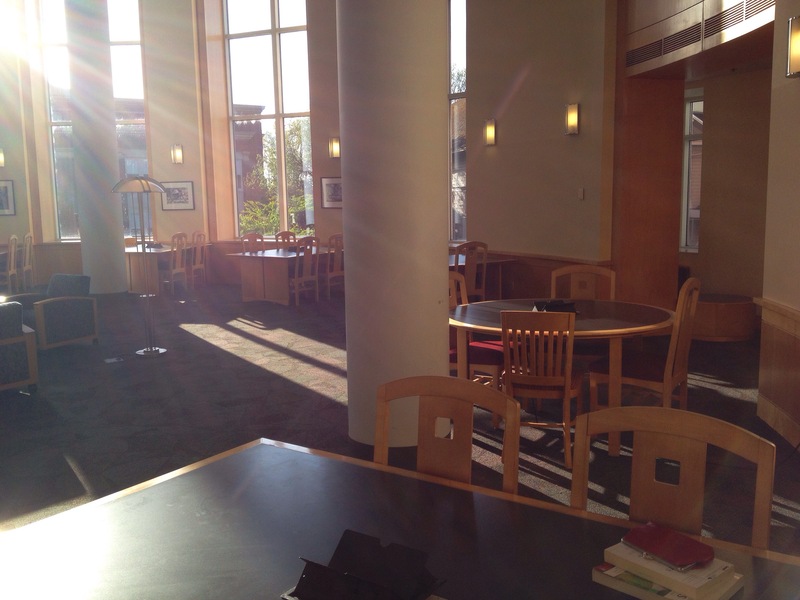 It’s usually difficult to get a study table, but at 8 am, with the morning sun streaming through the windows, I had the entire rotunda to myself. Here’s the deal: I love studying in the mornings. I am more alert in the mornings than I am at any other time of day. Yes, I’m the perky annoying person who muses about the meaning of life before you’ve had your coffee. Sorry. We switch places in the afternoon, I promise. So. I keep putting off my assignments because it’s the best way to trick myself into getting up early. If you’re wondering, “why don’t you just get up?? Why would you need to trick yourself?” Then you’re probably a judger. (In a Myers-Briggs way. Not in a scary Matthew 7:1 way.) I have to trick myself all the time. That’s part of the reason I’m (kind-of) into minimalism…it’s basically a way to trick myself into being cleaner and more organized. If you only have three things in a drawer it’s automatically organized no matter how haphazardly you toss them in. However. If you are a fellow perceiver who has to trick yourself into doing things, have you found any wonderful ways of making yourself get up early that don’t involve deadlines? Jenny’s last MOP post, about modesty, can be found here. Mom’s latest post about finding purpose in being scatterbrained can be found here. Jenny will post on Monday. This entry was posted in Thoughts About Life and tagged homework, morning, myers briggs. Bookmark the permalink. I have two things to comment on. 1. Is the rotunda in the library? And is the Pharmacy building within sight of the windows? If it is what I am thinking of, I remember studying there. I remember being there the day I found out that Chase Witham (old Harrisburg basketball teammate) was killed in Iraq. 2. I purposefully schedule things for early in the morning so I am motivated to get up early. I think it is a reasonable thing to do. Yes, the rotunda is in the library and it looks out over the Pharmacy building. It’s a nice place to study but the tables are usually full.